Find a Chiropractor and Sports Therapist. Tweed Heads / Coolangatta Australia. 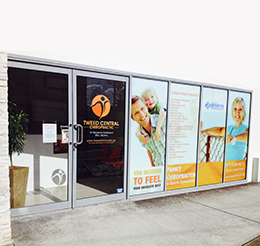 Located in the heart of Tweed Heads and Coolangatta, Tweed Central Chiropractic is easy to find with plenty of parking. Our facilities are modern, clean and welcoming. Our ground floor location provides easy disability access. View our clinic photo gallery here. For all other correspondence, please use the form below. Why Choose Tweed Central Chiropractic? Over 15 years experience in private practice. Dr Benjamin Holtsbaum (BSc, M.Chiro.) was a MacQuarie University clinic supervisor teaching fifth year Chiropractic students from 2009 - 2014. Registered primary health care provider with AHPRA. Member of the Chiropractic & Osteopathy Association of Australia (COCA). Easy ground floor disability access. HICAPS and EFTPOS Facilities, accepting all major health cards and Veterans Affairs.